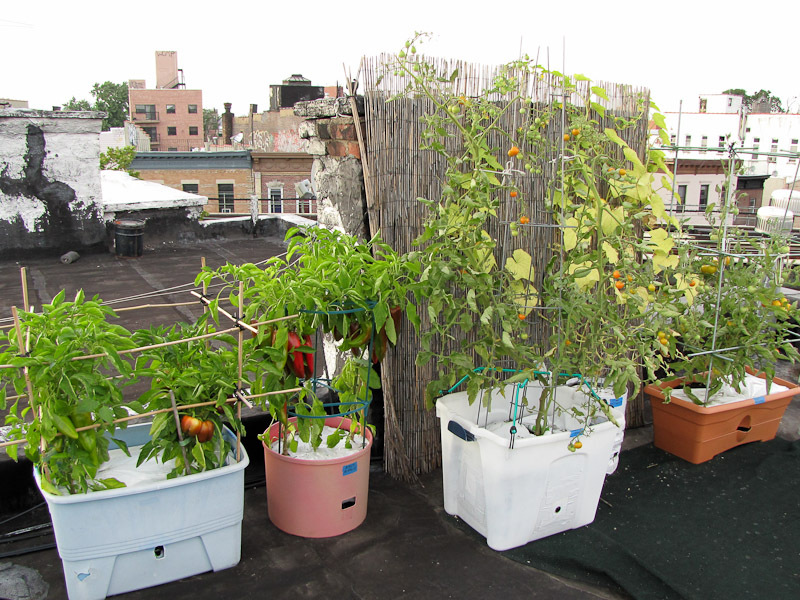 While it's always hot on the roof in the summer last week's dangerous heat wave was the first time the rooftop garden has had to endure such extended scorching temperatures. I was extremely nervous about how the garden would weather the incredible heat, but I was pleasantly surprised over how resilient the plants proved to be. 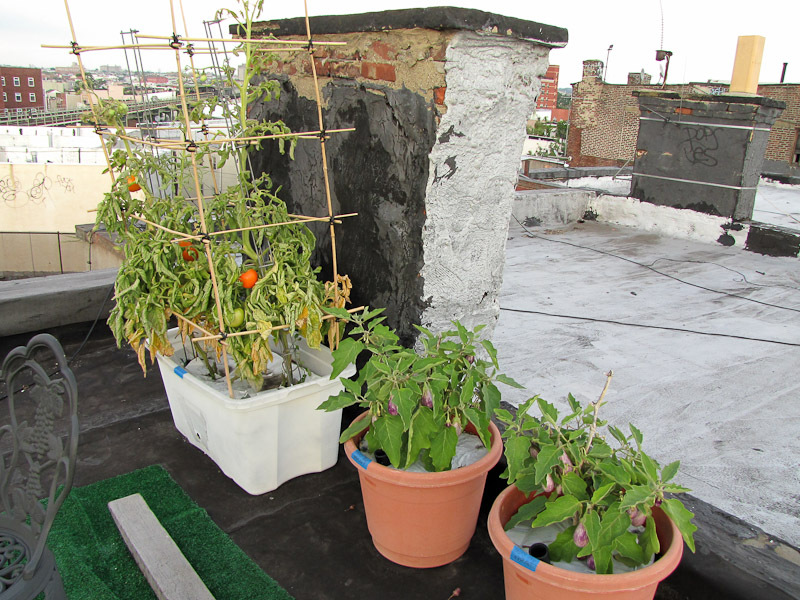 Even the stressed Valencia tomato plants, which do not like the rooftop environment at all, made it through, and I fully expected those plants to just keel over and die. 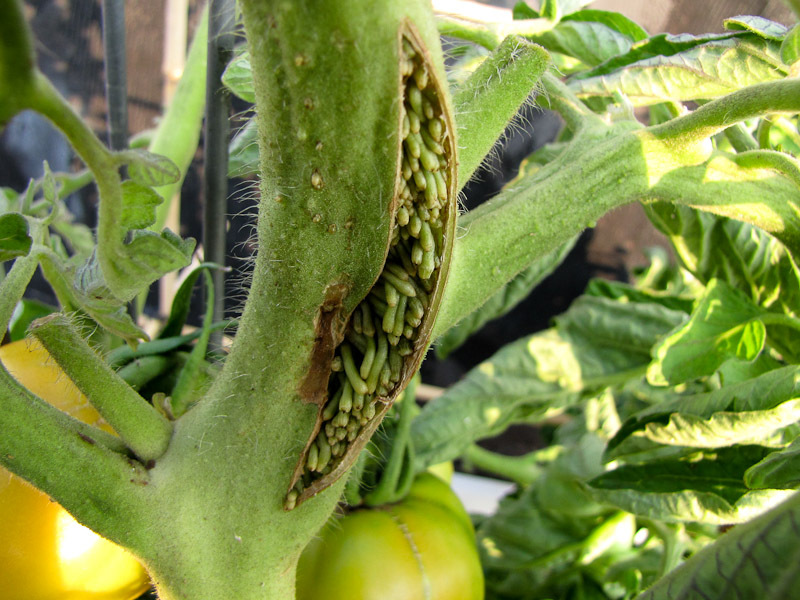 In a previous post I wrote that since the melon plants have reached the maximum amount of fruit that they can successfully support I should remove any later pollinated flowers. Well, I didn't. One more flower set fruit and I just could not bring myself to get rid of the little guy. I kept it to see if the plant could support 4 fruits while growing in this specific container size, a 16 inch diameter pot with a 1 gallon water reservoir. Anything I learn this year will help with my planting strategy for next year. 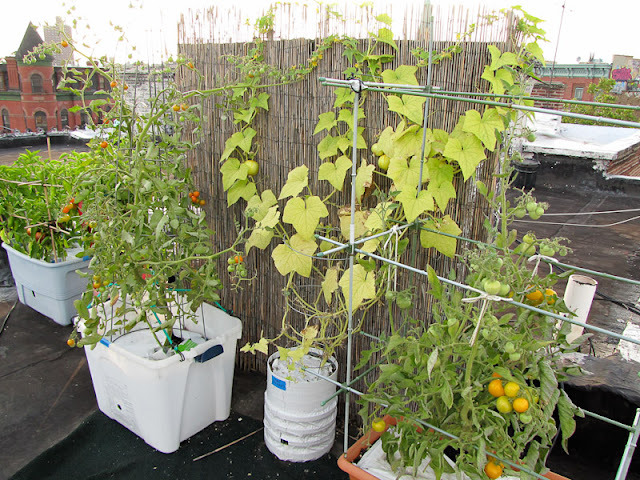 I do have larger containers with larger reservoirs, but those containers are always reserved for tomato plants, so lots of thought always goes into planning how to best use the smaller containers. 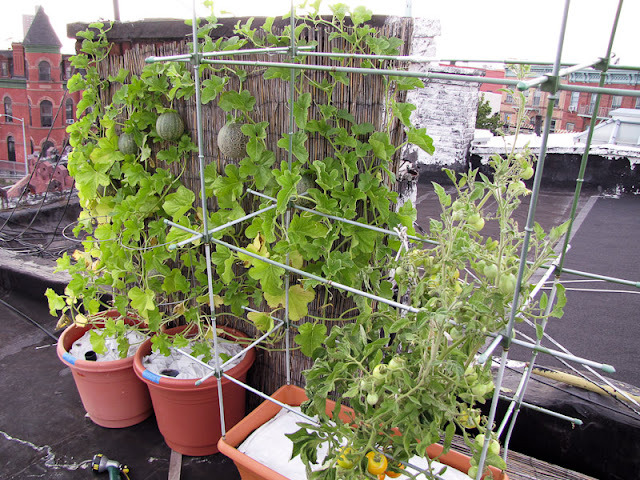 After observing this fruit for the past couple of weeks I think that the 16"container can support 4 melons per plant, but it's best if all the fruit set at around the same time. Fruit that set later will permanently lag behind its older peers. 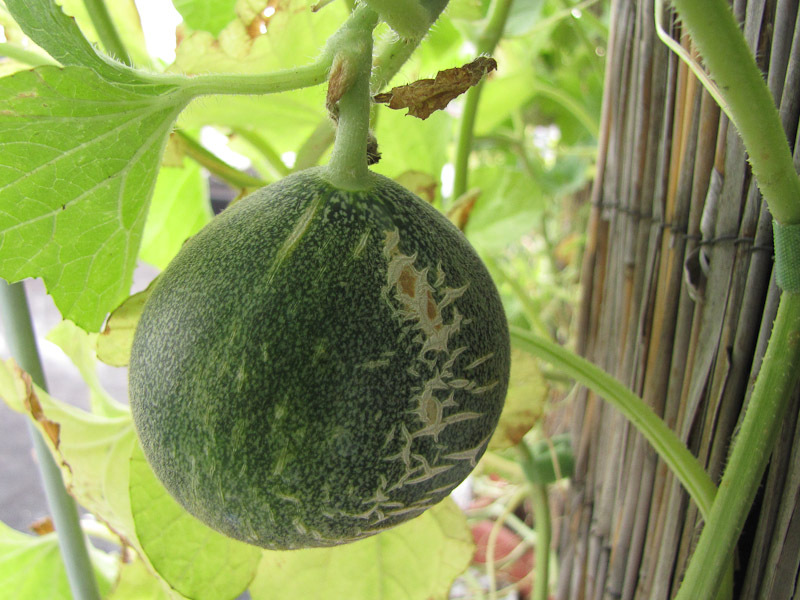 The melon in the above photo set about 2 weeks later than the earlier group and is growing very slowly. It has been stuck at racquetball size for days. The plant is focusing most of it's energy on ripening the fruits that set earlier so I doubt this one will get much bigger. 4 melons from 1 plant growing in small container does seem like a lot, but keep in mind I'm growing a small variety. Tasty Bites melons will only average 2 pounds each. If I was growing a larger variety I wouldn't expect to grow as many. The same peppers just 7 days ago. 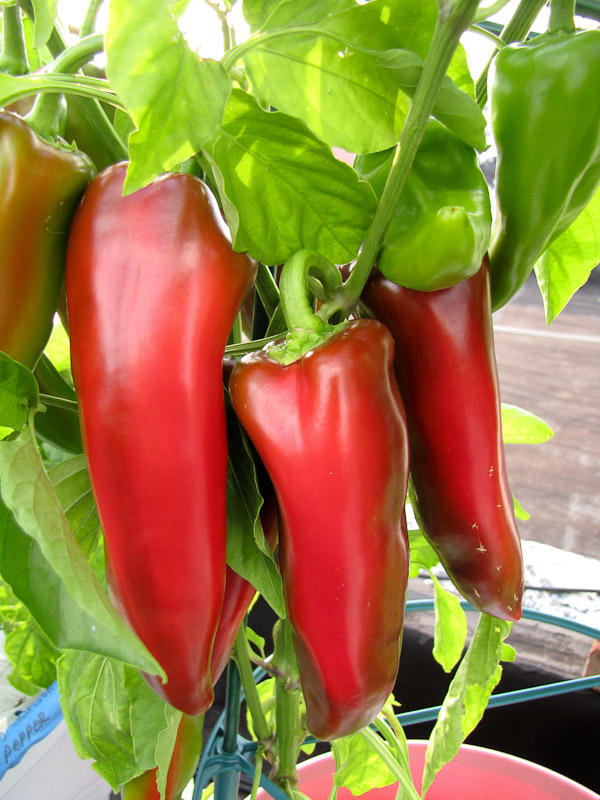 Woohoo, red peppers in July! The first Atris peppers to ripen took 9 days to complete the transformation, not the 7 days promised on the packet, but I'm not complaining (especially considering last week's tough growing conditions). 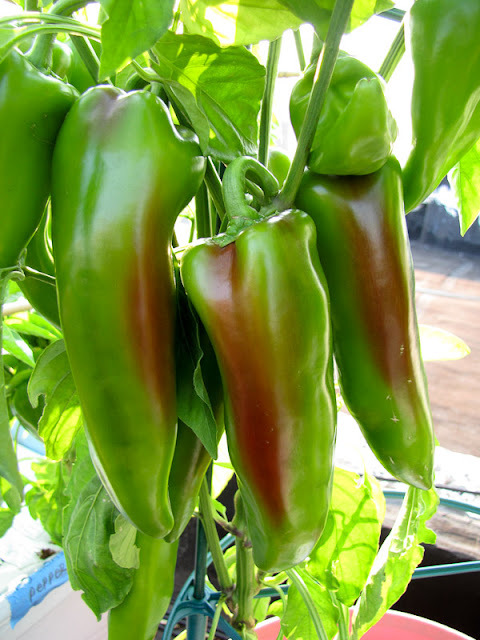 Most peppers take 20 days to turn red, cutting down the waiting time by over 50% is an impressive feat. 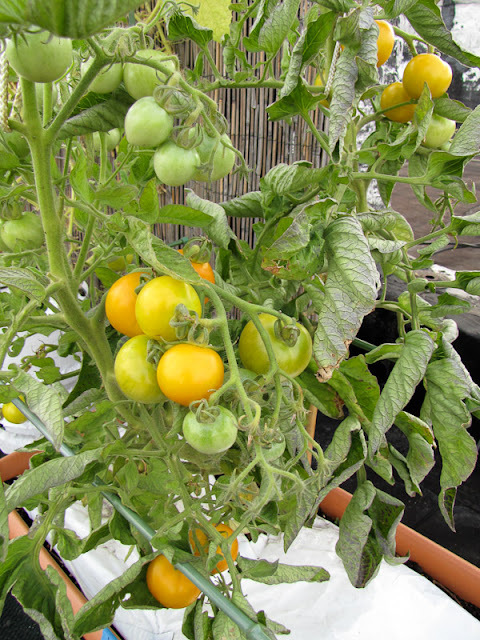 The Yellow Perfection tomato plants are very prolific. I'm not in love with their flavor, but I certainly cannot fault their performance on the rooftop. One of the Valencia tomato plants has formed adventitious roots along the stem. Either that or it's been impregnated by aliens. It's pretty gross looking. Tomatoes may also form roots along the stem above ground when humidity is high. Sometimes it is in reaction to stress or disease. Some varieties are more likely to do it than others. These actually developed a while ago, during a week of prolonged humidity, I just kept forgetting to take a photo. The above photo is for those of you wondering when to pick eggplants. Pick eggplants when the skin is still shiny and reflective. 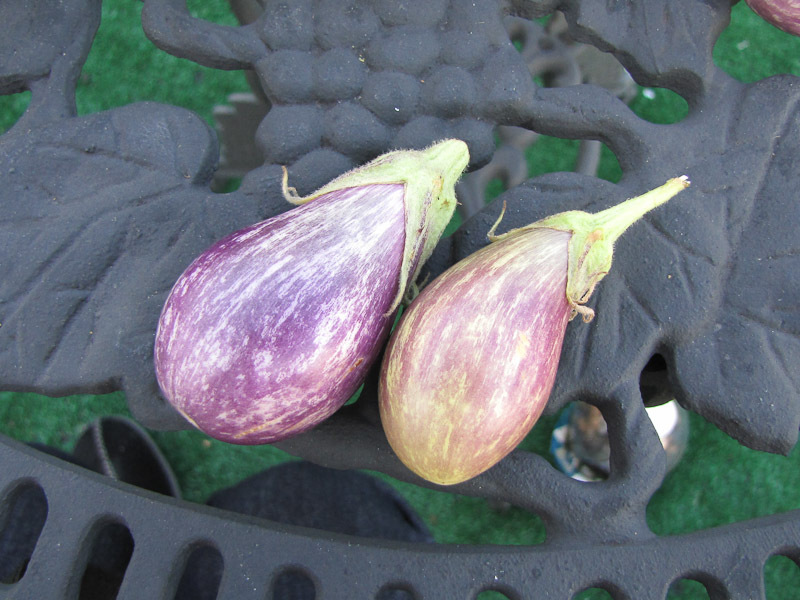 Eggplants that are past their prime will have dull, waxy looking skin, like the fruit on the right. Really old eggplants will also develop a yellow tint. 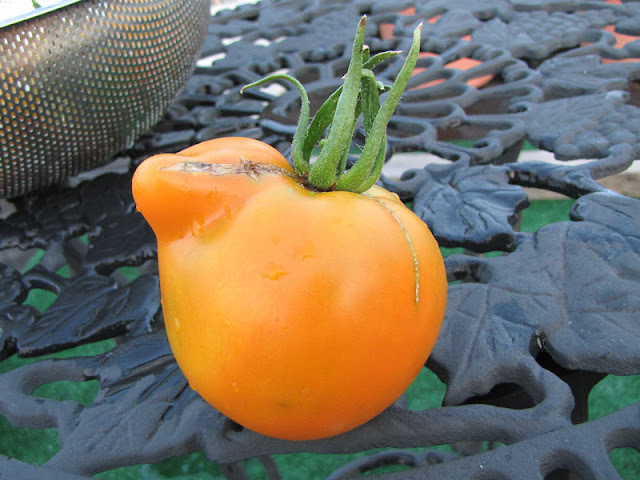 I don't like to use size as an indication of ripeness because that can vary depending upon the growing environment (in ground, in container, etc.) and plant health. 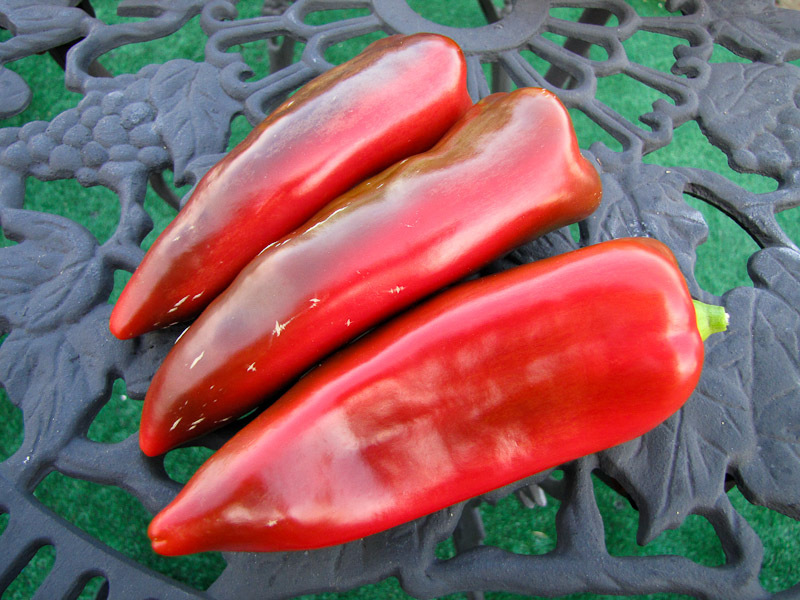 The skin quality test consistently applies to all eggplant varieties, so there's no need to research average eggplant size every time you grow a different seed. 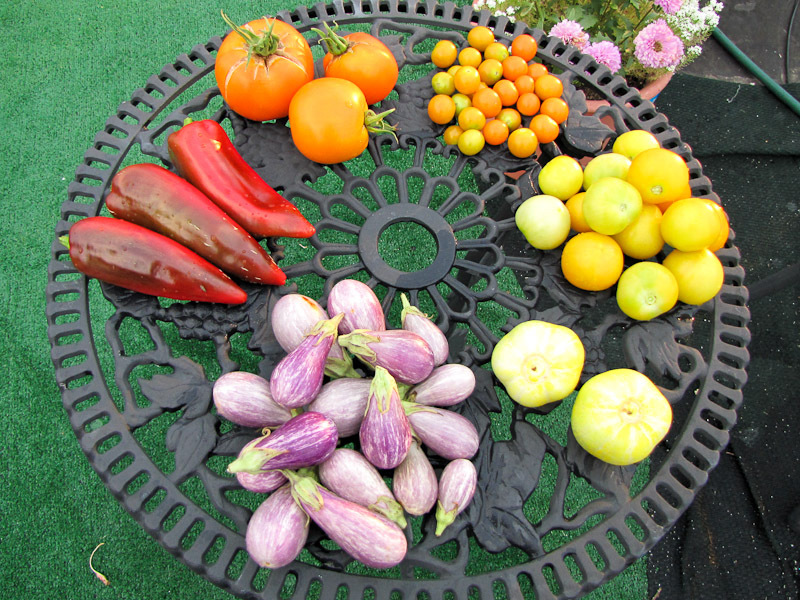 Large harvest from Tuesday, July 26th.